Demo Night companies announced - Explosive startups for Bonfire Night! TechHub Tuesday Demo Night is set to go off with a bang this month - this is the place to strut your stuff, get feedback, network & get involved with the community! Explosive stuff! "Oooo" at the new products; "Ahhh" the disruption; warm yourself on the raging bonfire-like passion of the demoers; get slightly heady on the mulled wine of possibility... ok, enough laboured Bonfire Night references - this is Demo Night, which is exciting enough on it's own! We�ve got some fantastic startups showing off their products on November 5th. Here�s a little sneak peek! Artworkster creates bespoke paintings based on the colours in uploaded images. The Arts worker team will be giving us a full demo from website to product. Deztress are an edtech startup, currently in the process of building an app that helps people with dyslexia unlock content online. Deztress will be demoing their prototype for us! As a social blogging network, Glipho is a massive next step for the blogging world. While traditional blogging places the burden of promotion and SEO on the blogger, Glipho combines its easy-to-use blog platform with the approach of a social network, which enables its writers to reach a wider audience effortlessly. LatestFreeStuff.co.uk is the largest freebie giveaway site in the UK. We get over 350,000 visitors a month. You can choose from over 500+ freebies including free food, free drink, free makeup, free magazines, free shampoo ect. Just launched our iPhone and Android app. It is unique and has never been done before in the UK. Journalists that we have contacted have been excited by the prospect. We think the app is brilliant because it is unique, mass market and gives out free stuff! Pay for your meal without having to wait for the bill, on the go! Use your mobile, tablet or even smartwatch to either pay for your entire meal, or split with friends. notiss is a social upkeep app to help people remember to connect with the life events of their closest relationships. No noise, just the moments and people that matter. Relative.ai Brand language is all around us on websites, social media, written copy and ads. Brands want to connect with customers but don't know how to 'speak their language'. Relative.ai uses law-enforcement grade technology to analyse patterns in language to help brands truly differentiate from competitors, and communicate with their customers for higher engagement. 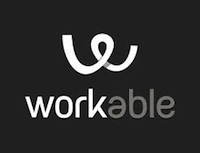 Workable helps businesses move from the outdated paper trail hiring methods to an efficient online process. Our standalone applicant tracking and candidate recruiting software automates time-consuming tasks and simplifies manual methods. As a cloud-based application, it�s designed to be conveniently accessible for everyone on the team. A huge thank you to this month's Demo night sponsor, Blackberry. If you haven't yet got your ticket for this month's demo night, you can do so here.